The marketing and creative production teams in the catalogue division, Legacy Recordings, at Sony Music are responsible for promoting 100+ years of music and keeping artists like Jimi Hendrix, Bob Dylan, Mariah Carey, and Michael Jackson in heavy rotation. Over the last five years, the music industry has gone through a pivotal transition as record labels successfully shifted to a streaming business model. To support the move from album sales to microtransactions, Legacy Recordings’ marketing and creative teams have moved to an “always on” campaign strategy. 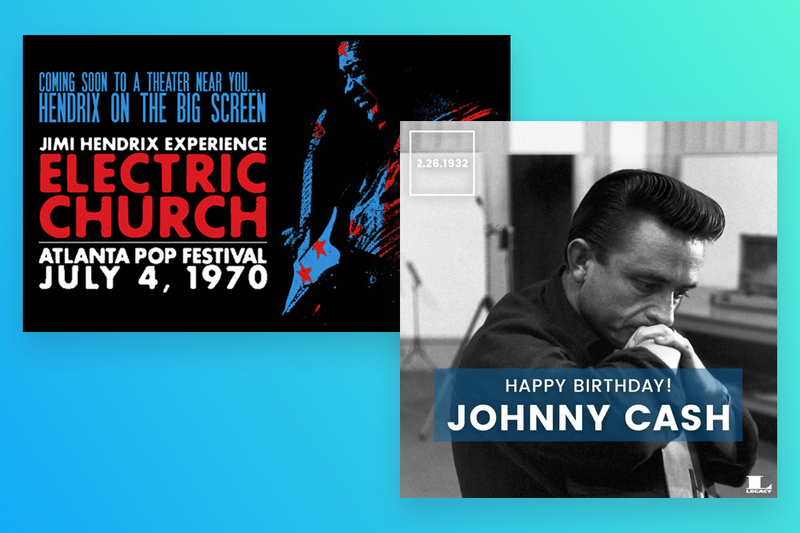 When Walter Gross, Senior Digital Marketing Manager, joined the team there wasn’t a standard process to develop promotional materials for the 1,000+ artists Legacy Recordings supports. With multiple campaigns happening simultaneously, this meant that creative and copy requests were frequently getting lost in never-ending email threads and “drive by” desk conversations. Missed critical deadlines because requests got lost or were missing important information needed to produce the work. Didn’t have visibility into the status of creative assets and couldn’t report on the production process to leadership. Couldn’t support the volume of campaigns and artists they needed to because their production process was out of sync with their marketing team. Weren’t able to leverage insights and learnings from previous campaigns to improve execution and creative production processes. Walter knew the team needed to centralize and streamline their creative production process so they could execute more campaigns to keep Legacy Recordings’ artists top of mind for music lovers—and hit their business targets. As the team explored Asana as a possible solution, they found it would enable them to connect and coordinate their campaign calendar and creative production process. It also offered the flexibility and customization they needed to support different marketing teams and workflows. Most importantly, Walter found it more intuitive to use than other tools they evaluated and felt confident the team would adopt it. To get started, Walter began moving the artist newsletter calendar for all Legacy Recordings’ artists and labels into Asana. Then the team built out a standard process to produce each newsletter so everyone was clear on responsibilities, creative needs, and dependencies. This immediately eliminated a lot of the pain, uncertainty, and confusion the team felt when trying to produce these newsletters through emails before. Next, the team built out their social media campaign calendar in Asana. Since the team manages both artists’ and labels’ social channels, streamlining and scaling creative production for these campaigns was critical to hitting their engagement goals. Now with Asana, all creative production and approvals are centralized in one project that’s connected to the campaign team’s calendar so creative needs and due dates are clear. Requests are quickly triaged and actioned, and the team can accurately report on the status of all creative to stakeholders and leadership. Scale their creative production process to create more ads, videos, and media formats for their social and email campaigns. Collaborate more effectively so they can focus their time and energy on strategy and creative direction instead of tracking down important information. Launch more campaigns to promote more artists so they can grow their social media audiences and email database. When artists like Adele, John Legend, Alicia Keys, and Beyonce, are “off-cycle” (meaning they don’t have a new album release coming up), the front-line labels don’t produce marketing campaigns to keep them and their music top of mind for consumers. This year, with the extra capacity they’ve gained since implementing Asana, the Legacy Recordings marketing team is taking on this work. The key to taking on all of this additional work? The team will use the processes they’ve built in Asana to successfully execute these campaigns and collaborate with front-line folks from Columbia, Epic, RCA, and more whot represent these artists. Reduced campaign production time by 75% by standardizing processes and making responsibilities clear. Reduced employee onboarding time by 80% because production processes are centralized and standardized.